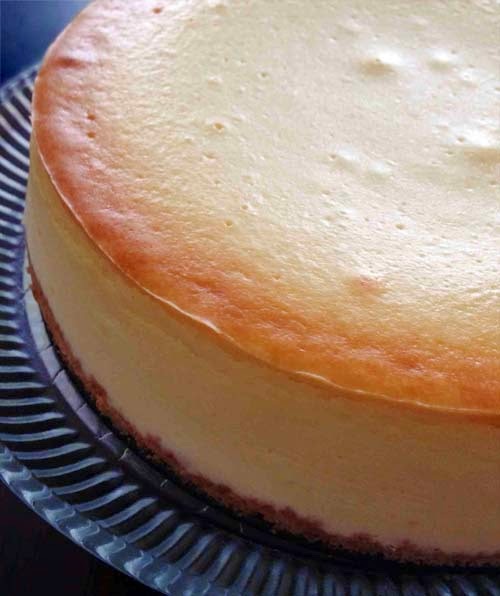 New York cheesecakes are known for their thick and creamy texture. It is too rich for many, but that's how you want them. Kraft has a pretty simple recipe on their website. The most notable exception is the use of Graham Crackers for the crust instead of Oreos. This recipe can be served plain without topping and still be super delicious. Something fun to consider is the addition of Jello topping. Lemon-flavored mix is used in this version. 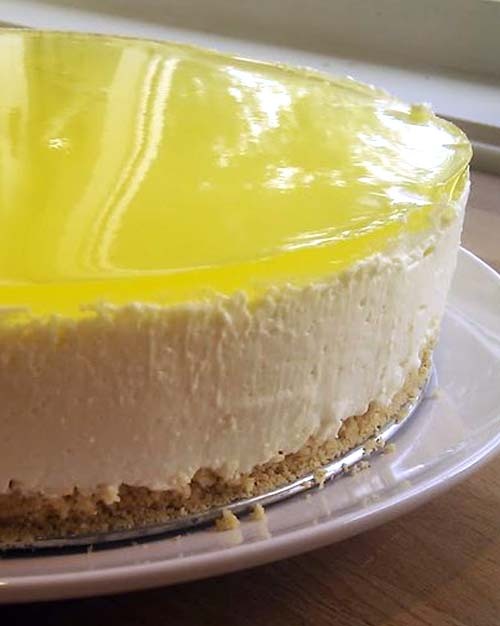 Finish making the cheesecake and allow to cool. Then, prepare a packet of Jello gelatin mix according to package instructions but with only 1/2 of water requirement. Let the mix cool in the refrigerator for 15 minutes. Pour over cheesecake and allow to set in the refrigerator for another 2 hours. Preheat oven to 325 deg F.
In a medium bowl, mix crushed crumbs and melted butter. Pour the crumbs-butter mix in a 9-inch springform pan. Firm it up with the back of a spoon to make a pie crust. Beat cream cheese, sugar, flour and vanilla with stand mixer until well blended. Add sour cream; mix well. Add eggs, 1 at a time, mixing on low speed after each just until blended. Bake 40 min. or until center is almost set. Run a knife around the edge of the springform pan to separate cheesecake from the pan's wall. This will prevent cracking as cheesecake cools. Cool completely at room temperature and refrigerate 4 hours. Garnish with any topping you prefer (see above for lemon jello topping) or serve as is. The video below provides a complete instruction. The recipe and, of course, the video show the use of a stand mixer. If you don't have one, you can mix the ingredients manually in a medium to large mixing bowl. But you should check out deeply discounted stand mixers on Amazon --> CLICK HERE. Visit Declan's profile on Pinterest. Disclosure: www.dessertinspired.com is a participant in the Amazon Services LLC Associates Program, an affiliate advertising program designed to provide a means for sites to earn advertising fees by advertising and linking to Amazon.com, Amazonsupply.com, or Myhabit.com.